I may be a bit scarce this week as I try to get all the last minute stuff done (not to mention the fact that my sweet in-laws and dear sister are both coming in town this week as well). But never fear! Frugal Friday will be up this week as usual! In the meantime, I have still been pondering the dilemma of three boys in one room...I have decided that we will definitely be using the bunkbed with a trundle. And I think we've decided to go custom. To either have it built or build it ourselves. The hubby could totally tackle this project, but time constraints might lead us to having it done for us. So I've been gathering more bunkbed inspiration...here's my latest favorite via Coastal Living. I love the idea of a nautical feel without being in-your-face, and I think this room does a FABULOUS job of that. Lovin' the houndstooth bedding as well. That's a look I've been wanting in the boys' room for.ev.ah. Also, I've really wanted to go with white beds, but I didn't want the room to feel "girly". I think this room feels totally "boy" while still using white! Love that! Finally, the winner of the Pick Your Plum winner is Sandee Spencer! Congrats Sandee...drop me an email and we'll get you set up with your prize! I hope your move goes smoothly...I will be moving myself and four kids to Germany in two months...ugh! I LOVE that boys room....I'm considering painting my boys bunkbeds white (worried also about the girlish look) but you're right, this looks just fab for the boys room! Good luck with the move. Don't forget your "last in, first out" box with the paper towels, TP, paperplates & first aid kit. I also put the hammer, nails, screwdrivers, alan wrench & assorted tapes & glues in. If you go with the BB look like the one pictured, why not do a toudh of gray or whatever color the bedding is going to be, in what ever beading, joins & seams on the bed, so you can have the white beds without the girly look? Good luck with your move and hang in there! If I had little boys I would love this to be their room! Good Luck on the last minute packing and move..I do love that bedroom photo and the nautical theme is one that never is outdated or out of style..Good for 3 boys in one room..For me it's a keeper..Have a good week..
We had good luck with Ana Whites furniture plans. My husband made a farm table for his first project and it was amazing. I love the idea of kids being piled together when they are young. It makes them into nicer adults I suppose. Good luck and speedy move for you! Love that room and the houndstooth fabric. It's beautiful! I do love the blue and white. The deeper blue makes it masculine and the white keeps it sharp and fresh. A hint of red or green might add a nice touch as well. Good luck with your move this week. Take a deep breath & hang in there! Can't wait to see how you decorate your new place! I'm your latest follower. My daughter and I just started a blog, "The Not So Empty Nest". Love what I've seen so far! I know you'll be glad when you're settled in your new nest! I hope your move goes well! We just moved a few weeks ago, and it's been slow-going getting everything unpacked. Love the inspiration bed. Airy, yet still appropriate for boys. good luck. i certainly dont envy your move, just look at it as the next big adventure. 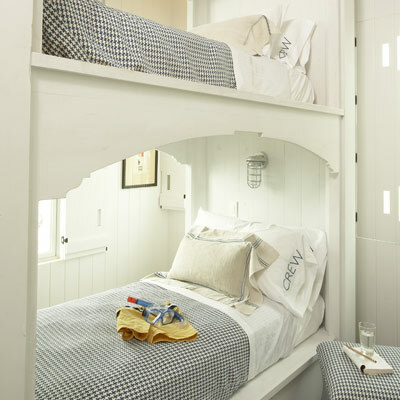 i like the white bunk beds, they do look like boys, which surprises me. cant tell if they have a trundle. i grew up in a tiny house. at one point we had bunk beds with a trundle and a tiny bed with a crib mattress all in one room. can you imagine? My thoughts will be with you for a smooth move! I can't wait to see the bunks!!! They are going to be fAbulous! Another reader here getting ready for a move, in 4 weeks. Anxious to follow along as you decorate the new place.